Ahhh melty-gooey-grilled cheese. The comfort food king. You could eat these every day. Let's face it, you probably have been eating these every day. Sure, you don't need dress up something so perfect, but it's so easy, why not? 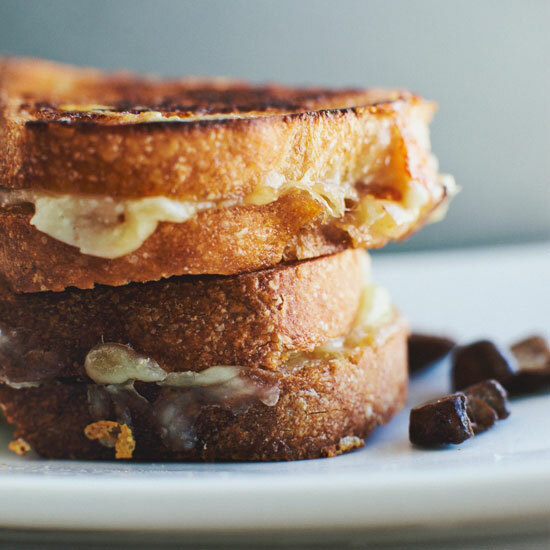 Here are 5 ways to make your grilled cheese even better. How can adding wine to your favorite comfort food not be fantastic? You drink enough of it so it only seems natural to add it to your sandwich. Convince yourself grilled cheese is good for you by adding a solid portion of eggplant to it. Not your traditional grilled cheese but this beautiful open-faced tomato sandwich gets its cheesy goodness from a hearty spread of feta. Something as simple as a sprinkling cheese on the outside of the bread and a little ham transforms a childhood classic in to a gourmet sandwich. Your friends will think you're fancy, but you will know how easy this was to make.